Things didn’t work between me and Ms. Hotness Alejandra, so I started my free single life again…and, after a few misses, I was in the line for the Harry Potter Forbidden Journey in Island of Adventure, when low and behold, I was talking to this incredibly witty lady, Ms. Hotness Bayou! We talked during the line until it was our turn to get into the ride, and when you get to the part where you are said “party of…?”, we looked at each other and laugh and said at the same time “party of two”…we had sucha blast that after the ride, we swap phone numbers and we ended up spending the whole day together. She had to go back to MS, which was sad, but well, that is life! We been talking ever since non-stop and things have progress that we made plans to see each other again, but this time in her turf. Since she lives closer to Metairie, i decided traveling thru Louis Armstrong Int’l Airport, which is in New Orleans. I rented a vehicle from my favorite website RentalCarMomma which offers amazing discounts. I originally picked a Chevy Aveo, the price was awesome about $95.00 total, but for $6.00 bucks more I can get a Ford Focus! So, I went with the Focus! So I head an hour from New Orleans, LA to Gulfport, MS…awesome scenic view of the North Gulf Coast which is totally different from the Florida Gulf coast. We decided to meet at a nice hotel that is by the coast, which will start our own vacation. I lend her the car, cause she is more knowledgeable of the roads and the whereabouts of everything. 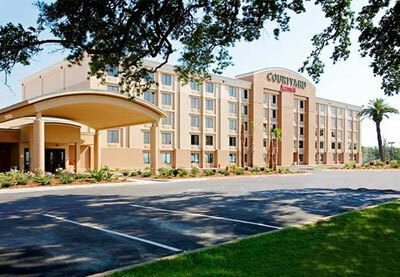 We stayed at the Courtyard Gulfport Beachfront, which has rooms with a nice relaxing feel. The next day we hit the road and went thru the highway 10 heading West toward Diamondhead Airport, then we stopped by a port nearby and got into her boat, a nice change of pace, never thought this lady had some surprises up her sleeve…she was wearing a flowery dress, that when the light hit her revealed her bikini, all I have to say is God’s masterpiece! We got into Jourdan River, which is awesome to look at and another sight of the bayou. It is a very serpentine river, but it has a nice length, plus Ms. Hotness Bayou was telling me that there’s a section with restaurants and other stores that makes it frequented by locals. That I do definitely like, that local feel! We hit this section that has a little shore and found a couple of boats in there, so she parked hers on the side, and we stripped to our bathing suits and hop in the water…we stayed in the water for a while and then relax in the shore getting a little suntan, we put some sun bronzing lotions (which let me tell you, was sucha thrill cause she had the most soothing/suave skin). When the sun was beginning to set, some couple came to us and asked us if we could take a picture of them with the sunset and we asked them if they can do the same for us. After that, she took the boat to another place in the river where they have the famous Jourdan River Steamer Restaurant! It is funny that there’s a waiter that was asking if we were going to seat or stayed in the boat, since the weather was awesome and the night was lovely, we decided to be in the boat, plus it gave us the little bit of privacy we needed. We got first our bowl of Seafood Gumbo (which she told me is the best in the area!) and then we asked for a huge serve of a mix between clams and mussels, oh my god man that was to die for…they usually go out in the wee hours of the morning and get those freshly fishy goodies! The famous bayou dish Gumbo was awesome with that irreplaceable Louisianan spicy kick. I felt pretty good with the way the vehicle handled the road, and made me feel comfortable and happy about taking that upgrade and for that awesome discount way much happier!